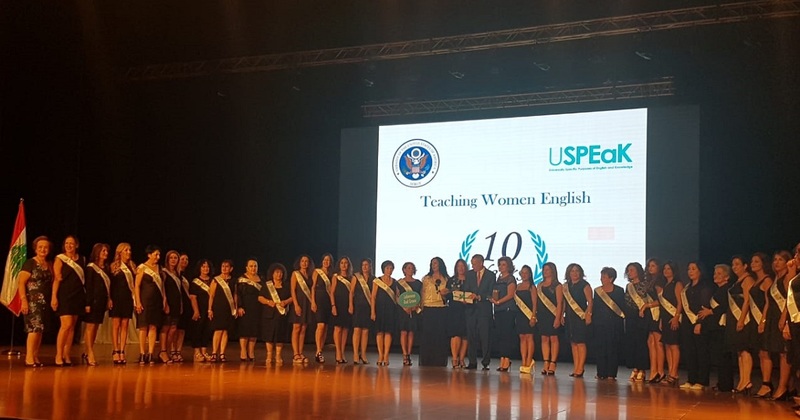 In partnership with the US Embassy of Beirut USPEaK held the graduation ceremony of its Teaching Women English program on Sunday in the palace of convention is Dbayyeh. 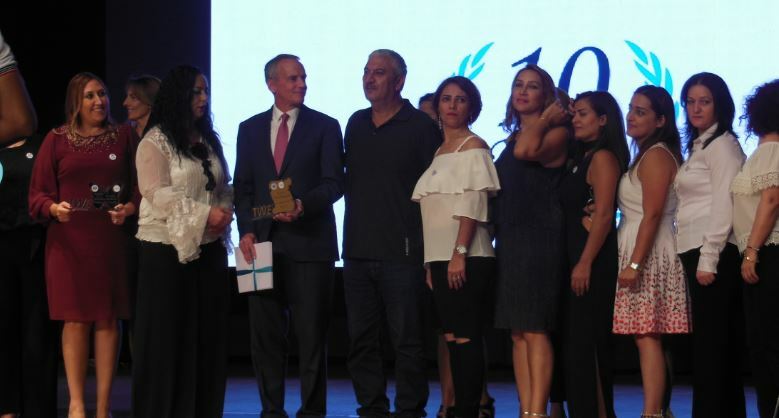 The ceremony was attended by deputy US Ambassador to Beirut Edward White, Cultural Affairs Officer Christine Smith, as well as security and municipal personnel from various Lebanese regions that were covered by the program. The event was preceded by both the Lebanese and the United States national anthems. It was noteworthy that the Lebanese national anthem was performed by 33 of the graduate women. This was followed by a video produced by USPEaK summarizing the events and activities the program participants took part of throughout the year in from north to south spanning all of Lebanon. Following up on the video, the Teach Women English Program Director Mrs. Rawan Yaghi emphasized in her welcoming speech the importance of empowering women at all levels, whether in teaching, working or even traveling. Yaghi pointed out that the program, alongside with English education, included many cultural activities. In addition to that also, the program organized cultural field trips that put women coming from different areas and regions together. Yaghi explained that the program also included awareness campaigns on topics such as women’s quotas, harassment and violence; as well as awareness on the subject of marriage, which is a partnership contract and not meant to be treated as an ownership contract. In the same context, Yaghi reaffirmed USPEaK’s belief in women and their empowerment, pointing out that women in Lebanon continue to suffer in terms of equality and civil rights. Following Yaghi, Deputy Ambassador Edward White delivered a speech in which he stressed the importance of this program to the American Embassy in Beirut. White pointed out that today he celebrates two things: The first is the graduation of these hardworking women, and the second is the 10 year anniversary of the launch of the program. 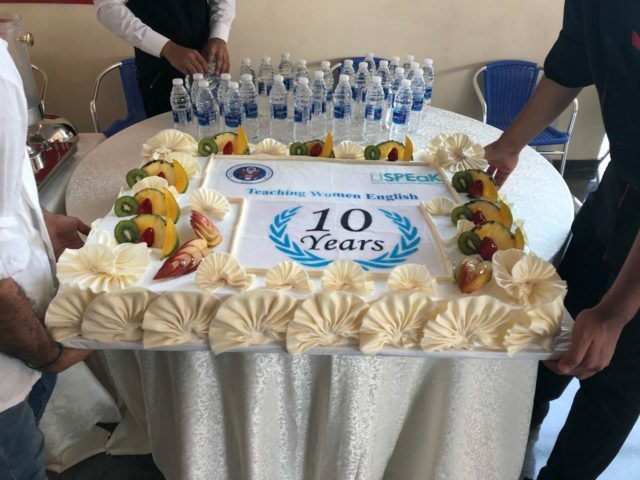 The cake was then cut to mark 10 years since the launch of the English for Women program in Lebanon. Soon after, certificates were presented to the graduates on stage presented to each class at a time. USPEaK President Rawan Yaghi explained to “Janoubia” that the success of the program today is primarily due to the success achieved by the participating women. “When we see women in Lebanon achieve their ambition by learning English in travel as well as work, and getting promotions, it drives us more to work even more for them,” Yaghi said. On the other hand, Janoubia spoke with a group of students about their experiences in the program. One of them admitted that at first she did not know any English words at all. After the six-month course however, she managed to travel to America and communicate effectively with the citizens there. A second student pointed out that the course made her able to communicate better with her children in English and to learn more about the Internet and that she felt more involved. Several other students had a complaint however. It was that the wished they could continue with future programs and they were unhappy that it was coming to an end.